This month the Italian Food, Wine & Travel - #ItalianFWT - blogging group is celebrating Fall in Italy. Jill at L’occasion invited us to gather around the harvest table and share thoughts of autumn, food, wine, and traditions. You can follow along the journey with my fellow #ItalianFWT bloggers. You can also chat with us live this Saturday morning at 11am EST on Twitter at #ItalianFWT. Hope to see you there! Nothing says autumn in Italy more, to me, than truffles. I tartufi. In gourmet circles, they are a treasure and - both literally and figuratively - worth their weight in gold. But in many parts of Italy, come autumn, they are just a culinary tradition that has nothing to do with gourmet sophistication. They are a seasonal food just like any other. I am fortunate enough to have good friends who own two Italian restaurants here in town. So, I headed to one of the restaurants, spent twenty minutes with Emanuele, and learned more about truffles than hours of research would have taught me. Actually, hours of research would not have been able to let me smell the truffles for that distinctive earthy scent or let me gently squeeze the truffles for that desirable sponginess or listen to Emanuele explain how his friend harvests these lovelies in Alba. Then he gave me a couple of ideas on what to do with my truffles. Truffles are a fungi and, therefore, related to mushrooms. But, unlike their mushroom relatives, truffles form beneath the surface of the soil and can only thrive in the conditions around stands of oaks, willow, and linden trees. All over northern and central Italy, they are celebrated with fairs in the fall. And when they aren't in season, you can find them preserved in jars and cans. There is a restaurant in Rome that made a unique gelato al tartufo. I was tempted to recreate that, but the weather has turned cold and gelato was not high on my list of to-dos. Instead I was inspired to create a dish with some wild, musky flavors that showcased the truffles' earthiness...and I wanted to use a whole fish. Slice the fish and sprinkle the inside with salt and pepper. Place 1 t minced garlic and some fresh fennel fronds in the cavity. Place fresh truffle slices inside - I used 5 or 6 per fish. Set aside. Line a Dutch oven or braiser - or any pot with a tight-fitting lid - with fresh fennel fronds. Place sliced onions on top. Place the pan over medium heat until the fennel begins to smell more aromatic. 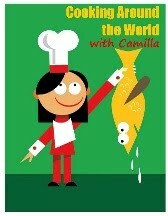 Place the stuffed fish on top of the fennel fronds and pour in the fish stock and red wine. Drizzle with 1 t (save the other teaspoon for serving) truffle oil. Bring the liquids to a boil, Scatter the mushrooms on top and cover. Place in the oven and braise for 25 to 30 minutes. Uncover and sprinkle with freshly ground salt and freshly ground pepper. Place fresh truffle slices on top of the fish - I used 5 or 6 per fish. Drizzle with remaining truffle oil and cover again. Let the truffles steam with the residual heat for 1 to 2 minutes. Serve immediately. When I was thinking about what wine to pair with my truffle dishes (yes, I planned more than one), I settled on Barolo. Anna, Emanuele's wife, had recommended I watch Barolo Boys. The Story of a Revolution. I haven't gotten around to it, but I will. Soon. In any case, I thought that the spice notes, dried fruits, and earthy aromas in Barolo would pair well with the black truffles. I got ahold of a 2010 Barolo - Rocche di Castiglione - by Giovanni Sordo. From my reading 2010 was almost a perfect year for Nebbiolo grapes and the 2010 vintage produced Barolos that were a clean, pure example of the varietal at its best. I was stunned by the color in my glass; it was shockingly red. Not like a deep garnet, no hint of purple, nothing like what I expected. It was just red - an extraordinarily stunning red. On the nose, I smelled leather, spice, and roses. On the tongue, it was straightforward in its vibrancy. It was balanced but with firm tannins. And it was delicious with our braised fish with truffles. And, after the kids were in bed, Jake and I continued to enjoy the Barolo with some dark chocolate from Madagascar. And that's a wrap on our October #ItalianFWT event. I hope you'll join us next month when Danielle of Feast on History has us virtually visiting a unique town in Italy. Until then, I will be posting more recipes showcasing my booty of black truffles. Stay tuned. A local brewpub - Peter B's Brewpub - turns twenty! Okay, they turned twenty last week. But I am finally getting around to posting this. You can read the piece I wrote for Edible Monterey Bay: here. So, for the birthday party, I rallied two friends and dragged my trio along for a dinner at the brewpub. "Mom," asked the little one incredulously, "we're having dinner at a bar?" Well, it's a brewpub. And they have food. They actually have really good food. Always up for some adventure, Jake and I both ordered new-to-us brews. I ordered their Cracked in the Rye which is described as a full-bodied IPA. I typically steer clear of IPAs, but with only 45 IBUs, I was curious. It starts with an almost sweet caramel flavor, but there is a lingering spiciness from the rye malt and the pink peppercorns. Jake still thought it was too hoppy, but I enjoyed it. That evening they were running a birthday special: their Dancing Goat, a Russian Imperial Espresso Stout, was only $3 a bottle. Yep, we couldn't resist. The server accidentally brought us a different stout at first. So, we tasted that alongside this one. The Dancing Goat was malty, smooth, and the first word that came to mind - besides 'wow' and 'yum' - was 'umami.' You know, that rich, savory flavor? I wanted to trade beers, but he said that I could have a sip or two only! Fine. On the food side of things, we ordered the chicken wings, the fried cheese curds, a pizza, and a burger. My friend couldn't resist the Beef Stroganoff because she was intrigued by the addition of lingonberry jam. I didn't try it, but it looked good. We had a blast...and we played with our food. Just a little! We'll be back to lift a glass with you again soon. I had to laugh at D's assessment of why it's called 'happy hour.' "Is it called 'happy hour' because it makes you happy?!? Happy birthday, Peter B's Brewpub! This is a sponsored post written by me on behalf of Social Nature. All opinions are my own. As summer wanes and we move away from tomato season (boohoo! ), I look for my best jarred or canned options. Truth be told, I have been steering clear of canned anything after I read about BPA in the lid liners. But, these - from Muir Glen - caught my eye. I'll try anything with San Marzano tomatoes. Really. I will. Discovering that the cans were made with BPA-free liners was a bonus! Additionally, Muir Glen is certified organic and Non-GMO Project Verified...all good reasons to have my patronage! San Marzano tomatoes are named for San Marzano sul Sarno, a small town near Naples where farmers first cultivated these in the shadow of Mt. Vesuvius. They boast fabulous, concentrated flavor. Muir Glen took those tomatoes and grew them in California where they processed them from field to can in less than 8 hours. To showcase their deliciousness, I used them - as is, meaning with no added seasonings - on a gluten-free pizza. Where I typically season pizza sauce with herbs and spices, I simply crushed the whole tomatoes and drained them. They were so tasty! I used a pre-made cornmeal crust for simplicity and topped it with the crushed, drained tomatoes, paper-thin slices of fresh zucchini, and shreds of Armenian string cheese. This is definitely a great recipe for when you're short on time and energy for dinner. Preheat oven to temperature indicated on your crusts. I used organic, frozen crust from Vicolo. These bake at 425 degrees F.
While the oven preheats, assemble your pizzas. Place your crusts on a baking stone or baking sheet. Spoon the crushed, drained tomatoes onto the crusts, spreading the sauce to the edges. Arrange zucchini slices over the tomatoes and cover with cheese. Bake according to your package, mine baked in about 18 to 20 minutes. Let stand for 2 to 3 minutes before slicing. Serve hot. *Disclosure: I received this product for free from the sponsor of Social Nature. As a Social Nature blogger, I agree to use this product and share my thoughts. My opinions do not necessarily reflect the opinions of Social Nature or the manufacturer of this product. for the second installment of their new food blogger party feature. All opinions are my own. Here we are in the second month of the new food blogger party feature on The Book Club Cookbook website and I'm excited to be part of this event. This month's title is Soup Swap by Kathy Gunst. * You can check out details about the #SoupSwapParty: here. I actually hadn't planned on posting a second #SoupSwapParty recipe, but after a disappointing ramen dinner at a new local restaurant - armed with Gunst's new cookbook - I headed into the kitchen to whip up her Short Rib Ramen. I write "whip up" but my homemade beef stock took two days to make. It was a process. But it was so delicious that I currently have more bones simmering in stock for a take-two. I was so excited to hear about a new ramen joint downtown. We love ramen - real ramen, not the instant kind. While I try not to comment on restaurants that are less than a week old because I understand about opening stress and growing pains, when I feel that a business is not doing right by its customers, I won't go back. Case in point: it was fairly early on a Friday and they were already sold out of things. Instead of serving their usual dishes in usual portions, selling out, and closing early, they opted to skimp on their ingredients while charging the same price. I went from disappointed to annoyed really quickly. And, as I said, we won't go back. I'm a little saddened by the experience because I wanted to love them. But, at least, I have a delicious ramen in my culinary wheelhouse. 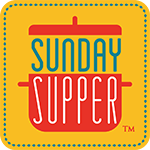 You can read my thoughts about Soup Swap by Kathy Gunst in my post: Corn and Sweet Potato Chowder with Saffron Cream & Sharing Meals. Just know that if you are looking for inspiration for upcoming soup season, this is it. Recipes excerpted from SOUP SWAP, © 2016 by Kathy Gunst. Reproduced by permission of Chronicle Books. All rights reserved. Make the eggs the day before serving! Place the eggs in a pot with the water, making sure that there is at least an inch of water over the eggs. Bring the water to a rolling boil. Remove from heat and let the eggs stand in the hot water for 15 - 20 minutes. Run the under cold water to cool. Reserve 1 C of the cooking water in the pan. Tap the boiled eggs to make a series of cracks all over the eggshells. Try to keep the shells intact. But if some pieces happen to flake off, don't worry. Add the remaining ingredients to the pan with the water. Bring back to a boil. Add the eggs. If there's not enough liquid to submerge them, add more water. Simmer for 2 hours. Turn off the heat and let the eggs cool in their liquid. In a large souppot, combine the stock, ginger, and cilantro. Bring to a simmer and simmer for 10 minutes. Spoon the meat into the broth and simmer till heated through. In another pot, bring water to a boil for cooking the noodles. Add a splash of oil and cook the noodles according to the package directions. Drain and portion the noodles into individual serving bowls. Divide the broth evenly, pouring it over the noodles. Top each serving with kimchi, if using, herbs, and halved tea eggs. 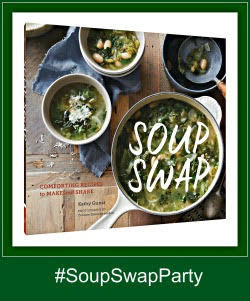 *Disclosure: I did receive a complimentary, advance reading copy of Soup Swap by Kathy Gunst for my participation in the #SoupSwapParty as well as complimentary items from event sponsors Chef's Choice and Zeroll. Opinions are my own. I received no further compensation for this post. This is a sponsored post written by me on behalf of Moms Meet. All opinions are my own. I'll just start with this: I don't typically take vitamin supplements; I prefer to get vitamins and minerals through whole foods. However, I'm not opposed to vitamin supplements and so, when the opportunity arose - through my association with Moms Meet - to try MegaFood products, I was intrigued by their company. Their stated mission to produce superior whole food supplements for those who care about their health and well-being resonates with me. The company started in 1973 (the year I was born!) and through the years they have grown and adapted, keeping their company informed and current with customers' needs. An example: in 2013, they self-verified that all of their ingredients are free of GMOs. Additionally, they support third party Non-GMO verifiers such as the Non-GMO Project and have elected to obtain this verification for many of their products. You can check out their complete list of certifications: here. They are gluten-free, vegan, kosher, and much more. But what I really love about them is that that they have fostered relationships with farmers and they proudly list on their Friends & Farmers tab: here. I was tickled to see that they use many of the same purveyors that I support already, including Foxy Organics and Lundberg Family Farms. In exchange for my honest review, I received four jars of their product*, including Kids Daily Multi that promotes well-being and healthy development and includes organic turmeric, carrots, fruits, and nearly two dozen vitamins and minerals per serving; Kids Daily Immune that features elderberry and echinacea from Uncle Matt's Organic; and Kids Daily B-Centered that aims to support mental focus, cognitive function, and a sense of calm. My list of what I didn't like is short, so I'll start with those two things. Only two. First, as I mentioned at the get-go, I prefer to get my vitamins and minerals through whole foods. Because of that, we have lots of discussions around our dining table about why we eat certain things. I have never been one to hide fruits and vegetables. So, the company's entire rhetoric surrounding hiding nutrition strikes me as completely opposite of how we should be talking to kids. One of the postcards included in my packet read: "You'll like the way real sneaky feels." And, on the reverse, it offered suggestions of how to sneak the vitamins in - in applesauce, yogurt, pudding, oatmeal, and more. It even invited us to share our sneaky tricks. Hmmm... That feels dishonest and, as a parent, I think my job is to teach my kids to eat correctly, not hide the correct nutrition in what they want to eat. Hiding nutrition doesn't help them in the long run; they need to learn to make good food choices. The labels even warns of settling. However, all four of my jars had settled to look much less than half full. I would suggest using smaller jars so that it gives consumers the appearance of more product. Again, this is not a reflection of the product quality, just a comment on the optics. The products. I already mentioned that I like the idea behind the company and the producers they use to make their booster powders. Now, I'll just be blunt: I really, really like the products themselves. We tried them in iced teas; we tried them in juice. But the most fun we had was trying them in the recipes that were included in our packet. I adapted the Peanut Power Bites for a great mid-day snack. Place all ingredients in a mixing bowl. Stir together with a spoon. You should be able to easily stir it. If it's too thick, add more honey; if it's too thin, add more oats. Refrigerate for at least 30 minutes. Once the mixture is chilled - it's easier to handle when it's cold - shape into teaspoon-sized balls. Serve immediately or store them in the fridge and use within a week. I am looking forward to trying and using the products more in the future. I think that the Kids Daily Immune will be helpful as the seasons change. After I emailed a reminder to the guys to turn in their timesheets, one of the owners of the company emailed me back: "I'll trade you: my timesheet for strawberry panna cotta." Ummm....okay. Yes, I really am that easy to sway into the kitchen for a culinary adventure. My husband joked that I was reinforcing bad behavior of turning in timesheets late; I reminded him that he would get to take a panna cotta to work for lunch, too. I didn't have any strawberries, but I did have some instant espresso powder that was beckoning. So, espresso panna cotta it was. And I laughed when Greg posted to social media: "Espresso panna cotta to go with my coffee for breakfast... #yesplease #myofficemanagerisbetterthanyours #sooooogoood @culinary_cam." Love the hashtags, especially the second one! Panna cotta is so easy to make. I don't know why I don't do it more often. Dissolve the gelatin in cold water in a medium mixing bowl. Place all the other ingredients in a medium saucepan and heat till it begins to steam. Do not let it boil. Let cool for 10 minutes, then pour the warm cream into the gelatin and stir till completely dissolved. Pour the mixture into your serving containers, leaving a little bit of space at the top - in case you want to top it with any sauce - and let chill until set, but at least four hours. Serve cold. One of my good friends makes amazing butter chicken. Really outstanding. It's sort of legendary in our circle of friends. D will come home, gushing that his friend - her son - brought butter chicken for lunch. In the lunchroom, her butter chicken holds the highest value. And K leverages it well in their mid-day food bartering. "I think you need to give me one more strawberry since it is butter chicken." She even brought some over last year on April 26th which is Jake's birthday and he opted for that instead of the dinner I had planned. No worries...I have thick skin. And, over the years, all of us have asked for her recipe. She finally assented and printed out copies for us in June. It has taken me this long to actually make it. I bought the chicken this weekend, but time got away from me. Then, yesterday, I swore that I wasn't going to turn on the stove - it was 95 degrees in Monterey - but the boys insisted. This is my version with slight adaptations. I used chicken thighs instead of chicken breast; I added a few more aromatics; I served it over a basmati-wild rice blend; and I added some chili paste to make it a little bit more spicy. But it was made in the spirit of her recipe. It was delicious. And, even better than delicious: it was not as difficult as I imagined. D did criticize my sauce texture. "Mom," he pointed out, "Ms. Priya's sauce is thicker. You should try for that next time. Okay?" Okay. In a large mixing bowl, massage the salt, pepper, 1 t chili powder, and turmeric into the chicken. Let stand for 15 minutes. In a large, flat-bottom pan, cook the onions, ginger, and garlic in 3 T butter until softened and the onions begin to turn translucent. Add in the remaining butter and melt. Stir in the garam masala, chili powder, cumin, cayenne, and cinnamon stick. Cook until fragrant. Add the chicken to the spiced paste and brown until cooked through, approximately 10 to 12 minutes. Pour in the tomato sauce and chicken stock. Add in the chili paste, if using; we like our butter chicken a little bit spicy. Whisk to combine. Simmer for 10 to 15 minutes - until the sauce is beginning to thicken. Pour in the cream, whisk to combine, and simmer until that it thickened to your liking. Serve garnished with cooked rice. Enjoy! On Friday I bought fresh edible flowers from MEarth. And, while I made this on Friday, I haven't had a chance to post it till tonight. Before Friday I had never heard of Monarda, also known as Bee Balm. Some reading indicated that I could use it anywhere that I would use Earl Grey tea. So, I decided to infuse some milk with the blossoms and make a milk pudding with it. Place the milk and sugar in a small saucepan. Float the monarda blossoms in the pan. Heat the milk slowly - just until small bubbles appear at the edge of the pot. Whisk to dissolve sugar. Let steep for 10 minutes. Strain the blossoms out and set aside. In a large mixing bowl, whisk together egg whites and heavy cream. Add this to the milk. Whisk in the egg yolks until smooth. Place 1 t of caramel in the bottom of your containers. Pour the milk into the ramekins to about three-quarters full. Place the containers into a rimmed baking dish. Pour hot water to reach half way up the sides of the dishes. Place in the oven and bake in the water bath until the pudding has set approximately 45 to 50 minutes. Let pudding come to room temperature. Then cover with plastic wrap and refrigerate for, at least, 3 to 4 hours before serving. Serve with garnish of more monarda blossoms.